Kayak Fishing is exploding in popularity! The reasons are simple. Kayaks are safe, exciting to fish from, inexpensive to purchase and to maintain, easy to transport, and less damaging to the environment. Best of all: anyone can do it. 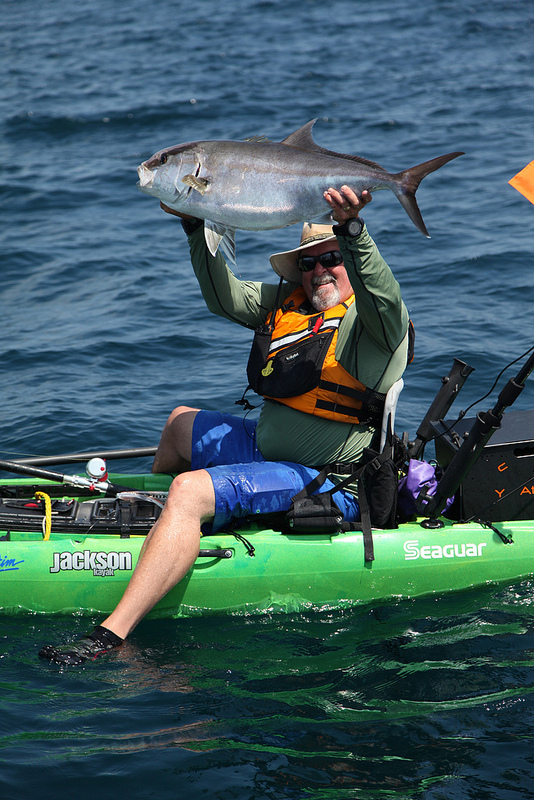 Jackson Kayak’s The Kayak Fishing Show with Jim Sammons and Seaguar’s Extreme Kayak Fishing Challenge are the first of their kind TV shows and adventure movies. Designed to entertain, educate and inspire anglers, whether or not they have ever considered fishing from a kayak. The shows follow world renowned kayak angler, Jim Sammons, around North America (and beyond) on the fishing adventure of a lifetime. Battles with marlin in Baja, halibut in Alaska, tarpon in Florida, stripers in Chesapeake Bay, muskie in Canada, and tuna in Panama are just some of what you can expect to see in this exciting series. On our blog we will not only keep you up to date with our adventures we will also post news about the latest kayak gear and goings-on in the industry. Our blog will also be filled with kayak fishing tips that we use and learned during our travels. Please feel free to post comments or questions and we will answer them as soon as we can. Make sure to look for us on WFN. Loved the first DVD, lads. Can’t wait to follow along as you film the second. Great blog about taking youngsters fishing. I agree, the light in their face when they catch something is worth it all. Glad you said to keep it simple and short. Sometimes we heavy duty fishing dads forget this. I even advise people to only take one rod on the first trip, as the day is for the youngster to catch fish. I’m a fairly large guy, 6’2″ 280lbs, and I have an 11yr old son, I am looking for a tandem kayak that could handle both our weights (he weighs 95lbs), any reccomendations would be welcomed. There are a couple you could try, The OCean Kayak Malibu II XL and another would be the Cobra Triple. Personally by the time my kids were that age they were in their own kayaks. I am sure that your son at his size could handle his own boat. Somthing like a OK Trident 11 or 13 or a Caper would be good for him, then you could have a good single for yourself a Trident 15 or a Big Game would be good choices. Thanks for the feedback Jim, I’ll get him his own kayak in the future, but for starters, i’ll look for one of those tandems you mentioned, to boost his confidence of being on the water. I couldn’t find your email address I’d like to dissuss an offer regarding Kayak Fishing. Fishing kayak has gained popularity among the people who love fishing. Kayak fishing techniques are very similar to boat fishing. Kayaks offer free hand fishing. Enjoy kayaking & fishing at the same time.